While it can be challenging to find vintage pieces that meet your size and style preferences, the efforts you spend seeking out fashions from decades-gone-by can be well worth the effort. Many vintage looks are coming back into fashion, and retro pieces are often quite flattering to women with full figures. Not to mention, sourcing vintage pieces that flatter your full figure can be a lot of fun - like a treasure hunt searching for gems from a time when designers created fashions with the bodies of curvy women in mind. Before you start shopping for vintage apparel, it is important to know your measurements. The way that vintage apparel is sized is not the same as the fashions of the day - even the phrases 'plus size' or 'women's apparel' are relatively new. Depending on the era that an item is from, it may be labeled as a half-size or simply with a measurement. Even if a vintage piece has a size label that looks familiar, keep in mind that an XXL from several decades ago may not be the same as an XXL of today. 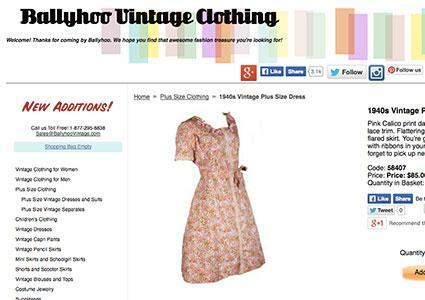 Ballyhoo Vintage Clothing is an online vintage apparel retailer with a section dedicated specifically to plus size fashions. Photos, measurements, and details about the size, style, condition and era are provided for each item, so you can be sure of exactly what you are getting. Plus size items are divided into two categories: (1) dresses and suits and (2) separates. You can browse the current selection by clicking a 'next' button on the screen, just like flipping through the pages of a magazine. Review information: The Fashion Sanity blog describes Ballyhoo Vintage Clothing as "a vintage store with a good selection of 40's and 50's clothes in larger sizes." Shopping details: The company has been in business since 1997 and ships merchandise worldwide. Merchandise can be returned within ten days of receipt for a refund of the purchase price, assuming tags are intact and the items have not been worn. Sign up for their newsletter to receive special offers and updates. Rusty Zipper allows you to search their inventory by size. When you go to the women's fashion page on the site, you will see a hyperlink for "My Size" near the top of the page. When you click it, you will go to a page where you can enter your exact measurements (preferred) or the size range that you need. This will narrow down the inventory shown so that you can see what is currently available in your size. From there, you will be able to search by decade or item type, such as skirts, pants, dresses, and more. Complete descriptions and photos are provided for all items. Shopping details: Rusty Zipper has been selling vintage clothing online since 1995, when it became "the first vintage clothing store on the Internet." Worldwide shipping is available. Returns are accepted within 15 days of receipt, assuming the tags are still attached and the items have not been worn. For orders over $200, a 15% restocking fee will apply for returns. Shopping on eBay is also a good way to find vintage items offered for sale from a variety of sellers. Some sellers may specialize in sourcing and selling vintage fashions, while others may be antique dealers, individual collectors selling some of their own pieces, or people selling items that belonged to their parents, grandparents or other loved ones. You can do a general search for plus size vintage clothing, or get very specific with your search, such as seeking out a specific style, decade, size or measurement. Be mindful that if the same item is shown in multiple sizes, it may be a vintage-inspired piece rather than one that is truly vintage. Review information: According to The Chic Fashionista, "some of the best vintage fashion shops are on eBay." A Huffington Post article also lists eBay as a great place to find vintage fashions from all eras and sizes, but points out that the sheer volume of items available can pose a difficulty for finding items. Shopping tips: When shopping on eBay, or any other auction site, it is important to review product descriptions, along with site and seller requirements and policies very closely before making a bid. Ask the seller any questions you have in advance, as chances are that you will not be able to return an item purchased this way. Review seller feedback and be diligent in taking steps to avoid online auction fraud. There may be places in your local community where you can find vintage apparel in your size. Thrift stores can be a good option, though you'll need to be prepared to dig through many non-vintage items in order to discover the type of treasures you are searching for. If you are fortunate enough to find something this way, chances are that you'll get it at a great bargain price. Most consignment shops only take clothing that is a few years old, so shopping their racks may not be the best option for you. The exception would be if there is a consignment shop in your area that specializes in vintage items - there you might find a treasure trove. However, the employees who work in consignment shops can be a good resource for you, as they meet many prospective sellers - some of whom might have items the store can't take but that meet your needs. Build a relationship with the people working at these stores, asking them to contact you when new items come in, or in the case of the consignment shops, you might even ask them to give your contact information to people who try to consign vintage items in your size. Consider leaving a flyer with them that has your name, phone number and email address along with a description of what you are looking for that can be given out, or even posted on a bulletin board in the store. Keep in mind that vintage stock changes frequently no matter where you are shopping. If you see an item you love, buy it then - you may never see it again otherwise. A store that doesn't have anything that meets your needs today just might have the perfect outfit tomorrow. Get in the habit of checking back often. Find out if there is a certain day of the week or time of day when the inventory is updated so you can check in right away. Finding a few good shopping resources, and checking back frequently, is an important key to building a vintage wardrobe.